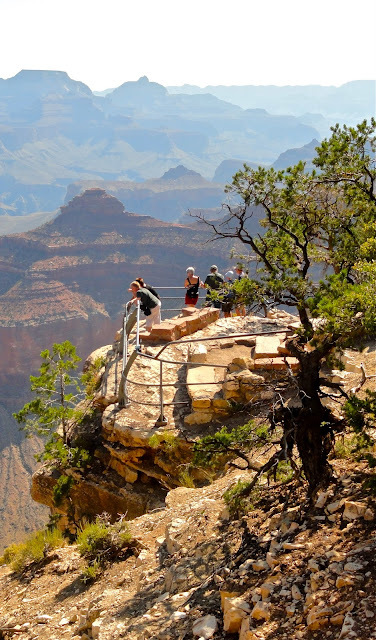 You'll spend a lot of time looking down but that's not all there is to do at the Grand Canyon. There's more to do at the Grand Canyon than walking over to the rim, looking down and gasping at its enormity. You can fill two days easily with mule rides, tours, shopping and learning the legends and history of this truly grand site so plan to stay overnight at least. Here's my guide. 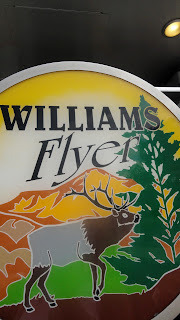 First where to stay. You don't really need a car; shuttle buses circle the main points and tour buses take you to otherwise off-limits spots. Tip: You will do some walking and negotiate some stairs, though; how much and how strenuous depends on where you stay. There is, however, a handicap van service that picks up and drops off at hotels' front door. Where you stay makes a difference. This is the cluster of buildings most visitors see and are convenient to shopping in the excellent Hopi House and historic Vercamps, Lookout and Kolb Studios. The mule barn and corral for rides into the canyon are here as is the Santa Fe Railroad Depot for the Grand Canyon Railway. 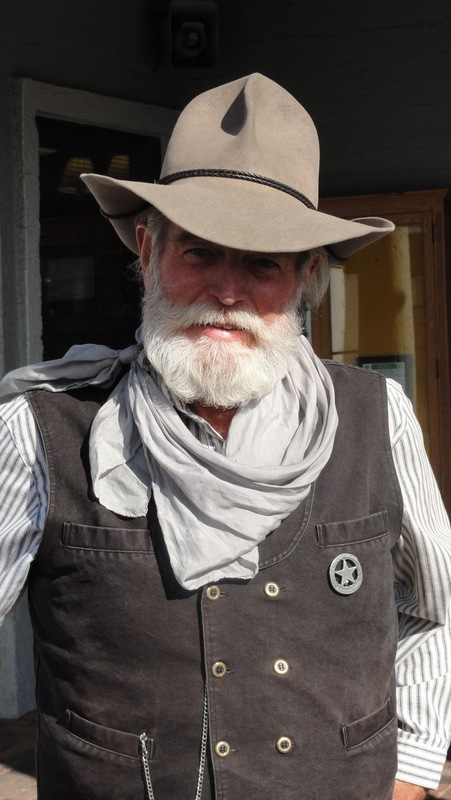 Bright Angel Lodge was the first, augmenting the tent camps of the early days, and it is where you go to make arrangements for mule rides and tours. As a result, it's quite busy. Tip: Try to get one of the refurbished, historic cabins at the canyon rim for less walking and fewer stairs. 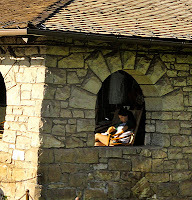 El Tovar is the most iconic, its food service is the best as are the views from its canyon-side porch. It's also the first to book up, 10-13 months in advance. However, you don't have to be a guest to dine there or enjoy a beverage or a rocking chair on its porches). Anyone can snag a rocker on one of the porches. Rooms are reasonable for their value and it probably is the only place where Sir Paul McCartney was told to stop playing the piano and making such a racket! Warning: There are no elevators (floors are 16 steps apart) so try to get a room on the first floor. Also, with the exception of the special handicap van, shuttle buses aren't allowed in the lodge's circular driveway which means you will have to walk downhill to catch one, up hill to return. Tip: Trying to reserve rooms ahead of your visit can be frustrating but if you're willing to take a chance, go to the desk as soon as you arrive at the canyon. You might luck into a no-show's room and insiders tell us the odds are better than you think. 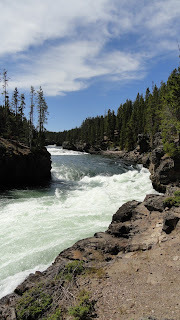 I stayed here at Maswik Lodge, as close to the rim as you could get but also farthest away from the Lodge. Maswik Lodge is off-rim, a 5-minute downhill walk away which means you'll walk uphill on a path or via stairs to get to the rim. 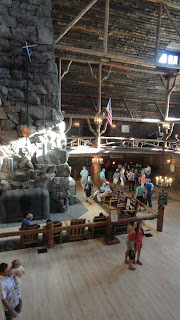 I didn't stay in the Lodge but in one of its two-story buildings that are scattered around stands of ponderosa pines. If you're driving there is convenient parking for these. If not, opt for the lodge or a room in a building close to it because shuttle buses come right up to the lodge. The Plaza, a mostly flat area, has all the comforts of suburbia - a post office, general store, lots of parking. Yavapi Lodge is adjacent to the Plaza so if you are traveling with kids, this is your best bet. You can park next to your room - they're basic but run only about $112 - and you are away from the rim so there's no worry about a youngster falling into the canyon. There's also a cafeteria, gift shop, deli and pizza place. Note: Next post, what to do. 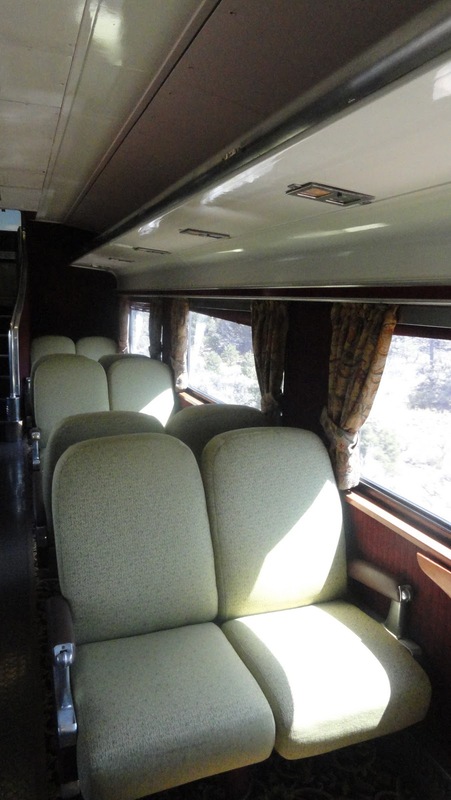 Before there were mules winding their way down Bright Angel Trail, before there was a Bright Angel Trail, before there was even an Arizona, there was the Grand Canyon Railway and there still is. 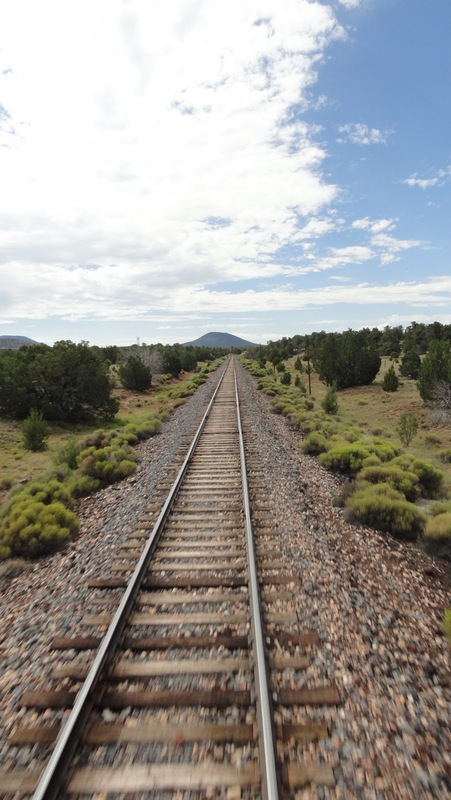 Like everything else you'll find at America's grandest ditch, the railway was developed to attract and to bring tourists into the Grand Canyon. The town of Williams grew by supporting the railway and the Grand Canyon Railway Hotel was built by the the innovative Fred Harvey in partnership with the Santa Fe Railway, and its restaurant staffed by his famous "Harvey Girls." The Santa Fe Railway is gone as are the Harvey Girls, but the train chugs on, the hotel has been handsomely refurbished by Xanterra and the railway station still adjoins it. The beds and linens are comfortable and the rooms are quiet, always welcome when traveling. There's a large indoor swimming pool. Best of all for Levelers, minimal steps and stairs plus a convenient elevator. 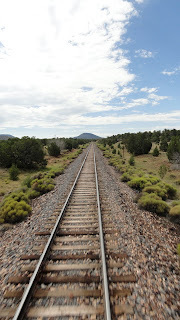 Sure, you can drive to the Grand Canyon, but arriving by train is a lot of fun and adds to the experience. Besides, buy a package and the staff schleps your luggage from the hotel to where you stay in the canyon and back to the hotel. The GCR hotel has many historic touches along with innovative recycling and energy saving programs. You can get bar chow in the picturesque bar, but most guests eat at the Depot dining room buffet with pasta, carvery, omelet and pancake stations depending on the time of day. Tip: Walk the few short blocks - flat - and dine with the locals at Pine Country Restaurant, at least for dessert. They're famous for their pies (47 different varieties), all made in-house. Best sellers are the coconut cream or the Oreo pie, but my fave: same as owner Dee Seehorn's, the cherry-apple-peach combo. 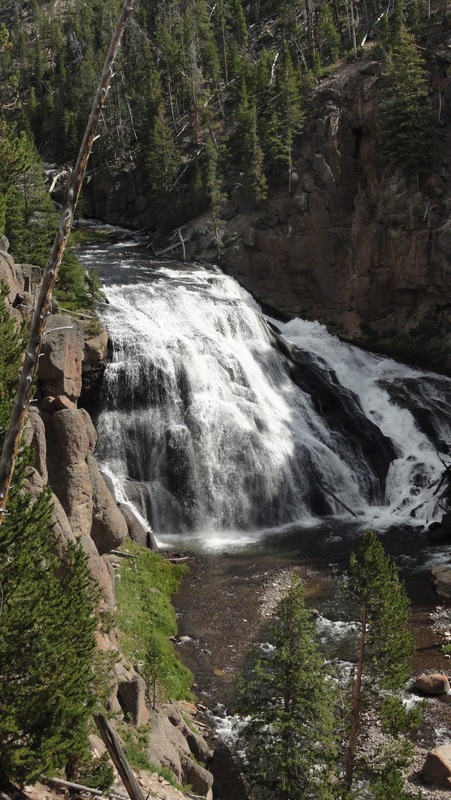 Another tip, take time to visit nearby Bearizona. Owned by the same family that developed Bear Country U.S.A., the 160-acre preserve gets you up close and almost personal with a fascinating array of critters from the bears of the title to raptors, wolves, Dahl sheep, racoons and a handsome pair of bobcats. Before you board, you'll be entertained by a pair of singing cowboys and a pseudo shootout, after which you and the kids can visit with the actors and pet their horses. Those in the know recommend the observation dome into the canyon, the luxury parlor on the way out. 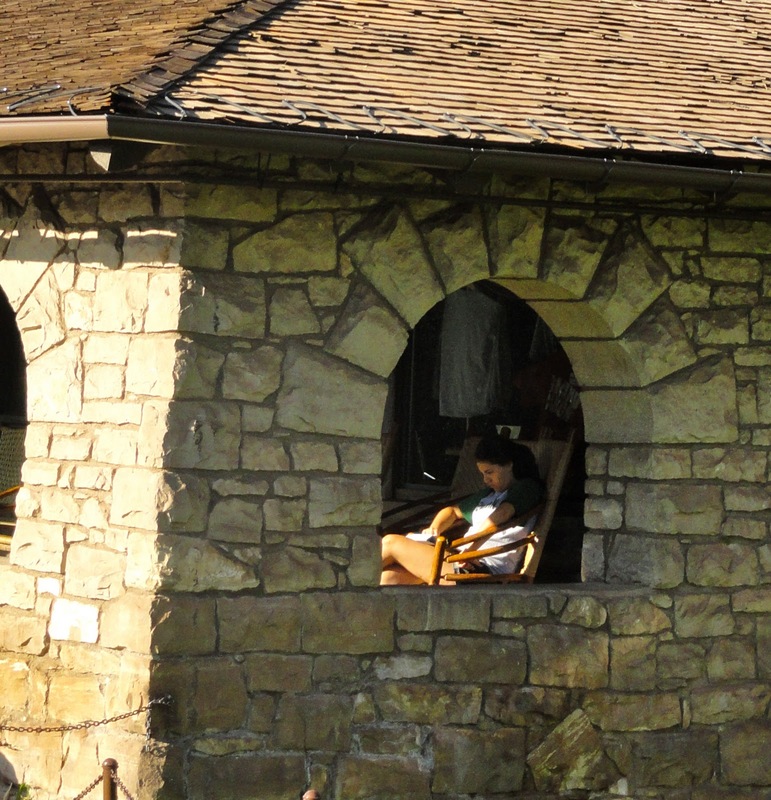 I found the parlor quite comfy and liked being able to go out on the open-air platform. Warning, Levelers, there are steps up to the observation cars. Bars and snacks are available at all levels of service, mostly complimentary at the highest ones. The ride is a pleasant one and those booted troubadours will be singing here, too. On the return trip, weather permitting, you might be on the lookout for bandits. 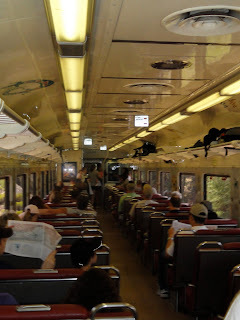 The train is frequently "robbed" although Marshall Goodmore has unblemished record of nabbing desperadoes. There are more different options, discounts and packages for train alone, train with rooms, etc. than the train itself has cars. You're bound to find one that suits your needs and schedule. Next post: Inside the Grand Canyon. You'll never feel closer to nature - from visual evidence of the constant movement of the earth steaming and shifting below your feet to a hawk "resting" on the thermals over Pelican Creek trail head - than at Yellowstone National Park. Ken Burns showed us the park and told its history but nothing short of being in it prepares you for the vastness, the richness and the beauty. From its position as the world's first national park, superlatives abound. 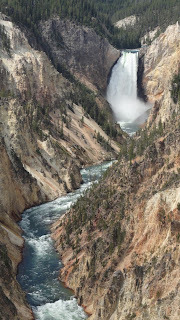 With some 10,000 hydrothermal features Yellowstone has more geothermal activity than in New Zealand and Iceland combined. 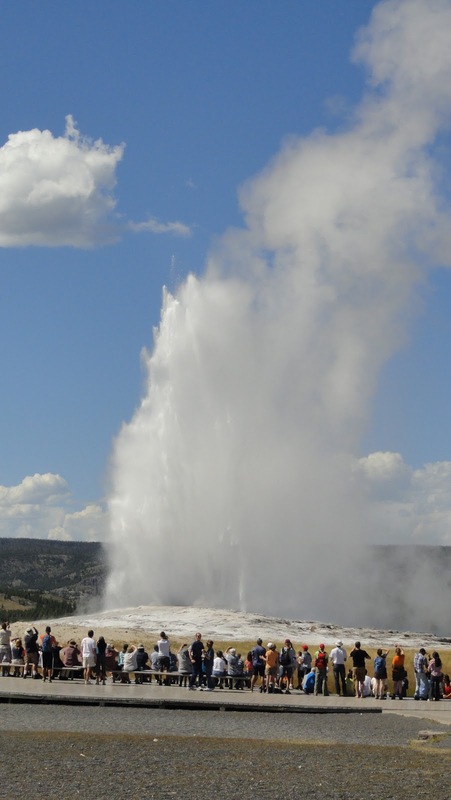 Hot springs, geysers, mud pots and fumaroles bear witness to earth's dynamic, roiling core. Yellowstone Lake, 132 square miles with 141 miles of shoreline. is the largest high elevation lake in North America, so large it creates its own weather. Underneath a portion is the caldera formed by a volcano. There are interpretive tours and you should definitely take a few, but the park is so spread out you really need a car. Roads are good and figure-eight from one end to the other. 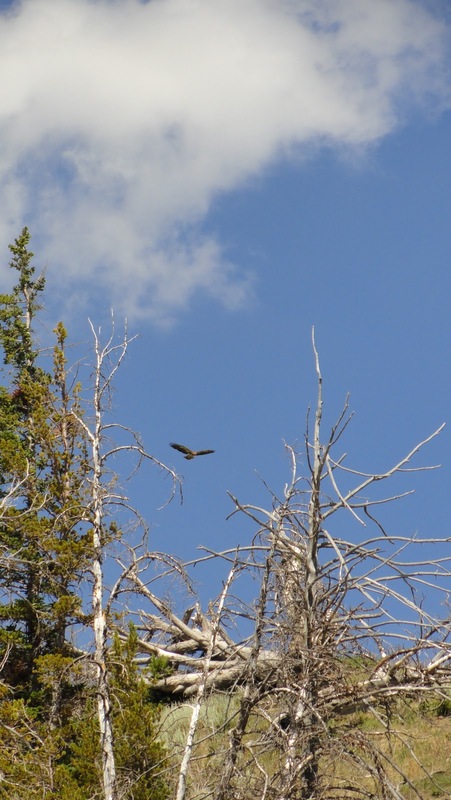 Buffalo roam, deer and antelope play, trumpeter swans fly overhead and elk, moose, pronghorn sheep and bears - grizzlies and black - keep rangers busy closing trails and trying to keep foolhardy visitors from becoming a meal. Tip: If you see cars pulled over on the side of the road, join them because they've stopped to watch and photograph wildlife. Avid wildlife watchers are very generous and usually let you peek through their telescopes for a real close-up. Buffalo - or bison as everyone out here calls them - are the easiest to spot. You may see them grazing under your window first thing in the morning or walking down the middle of the road. The big bulls particularly like following the dotted yellow line and motorists are stuck following along until the beast reaches its goal and turns off. Tip: Dawn and dusk are the best time to watch the wild side. Hayden Valley at the park's midsection and the plains south of the northeast gate are good places to start. No walking needed, just watch carefully as you drive slowly along. Old Faithful is on everyone's bucket list with good reason. 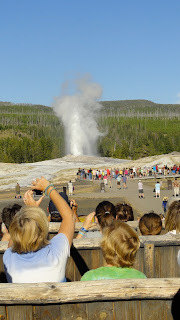 Tip: Most people gather around the railings surrounding the geyser but I recommend going to the Old Faithful Inn, walking up the 18 steps to the mezzanine overlook, obtaining a beverage from the bar and taking a seat on one of the overlook benches to see its grand show every 92 minutes or so, not to mention the other geysers spouting off around it. You can circle the whole basin via the walkway but you can see the others just as well from the Inn. 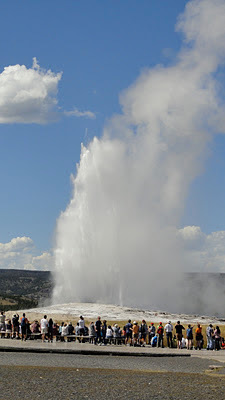 Old Faithful is only the beginning. 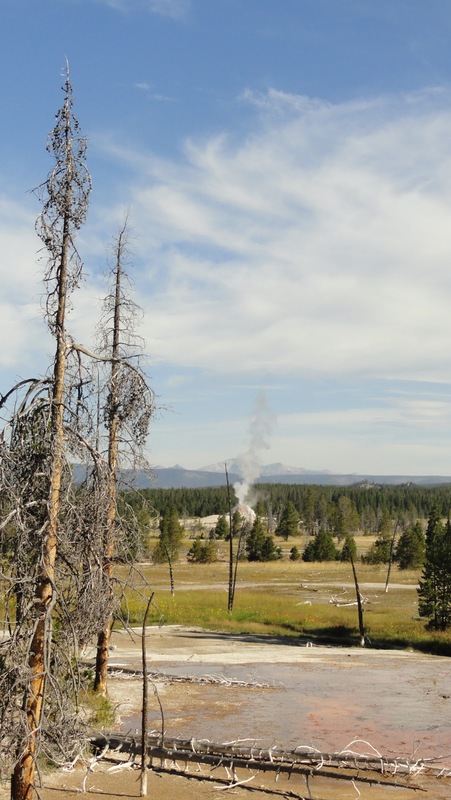 The geyser basins to the north will captivate you. Among those I liked: The Cooking spot, Abyss Pool (one of the few ever measured, it's 51 feet deep), Grand Prismatic pool (best colors are around noon), Firehole spring, White Dome geyser, Great Fountain geyser, Fire Hole Lake, Fountain Paint pots, Clepsydra geyser. Tip: The Park Service does an excellent job making these marvels of nature accessible. Walkways circle the areas and most are generally flat with only small rises. Reaching Gibbon Falls, then seeing the waterfall it creates takes a bit more effort but is well worth it.At Gibbon Falls Trail you can overlook the Gibbon River at its brink where it begins the spectacular downward plunge then walk down to the overlook and see it crashing on the rocks. Tip: Ready? It's 14 steps to a landing, 17 steps to another landing, 14 steps to the next landing and 12 steps to the final landing. You also don't want to miss Artist's Point or Inspiration Point, the overlooks into the canyon and at the falls of the Yellowstone River. You'll walk up a gentle rise from the parking lot before you hit the steps. Tip: You have a choice, a ramp or a series of 12 steps to a landing followed by 12 steps to the last landing plus 25 steps then 12 steps to the top. Recommended if you can do it. I tried three of the lodges and although there are camp grounds and rustic cabins, I suspect most of us Levelers will want elevators and en suite bathrooms. Lake Yellowstone Hotel is a classic 1920s yellow and white building that has been added onto until " rambling" is an apt descriptive. It's the airiest and most elegant of the park's facilities with grand views of the lake. The dining room is spacious and the food is good; so is the wine list. A large bison herd visited the morning I was there. Tip: Ask for a room facing the lake and not too far from the elevator. Don't be shocked to learn there is no TV, Internet access or air conditioning. 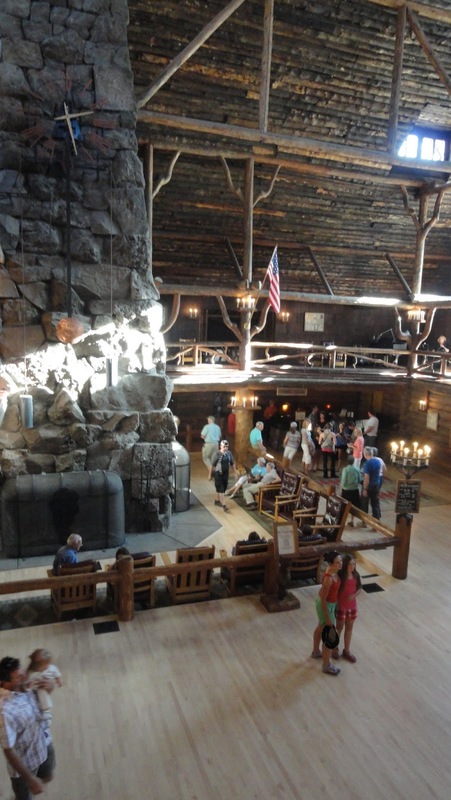 Old Faithful Inn, a National Historic Landmark built in the early 1900s, personifies Yellowstone with its hand-hewn logs and enormous stone fireplace. Fare in the dining room is excellent, as is the wine list. Tip: The original rooms are full of atmosphere but you'll probably prefer a room in the newer section where there's an elevator, despite the long walk to reach it. This was my favorite. Mammoth Hot Springs Hotel, built in the 1930s, is known for its map room with the map of the United States made of 15 different kinds of wood from nine countries (that's the sort of thing they did back then). My stay was short and I left without having a real feel for the facility or its nearby attraction. One last tip: If you haven't been, quit putting it off. Go.